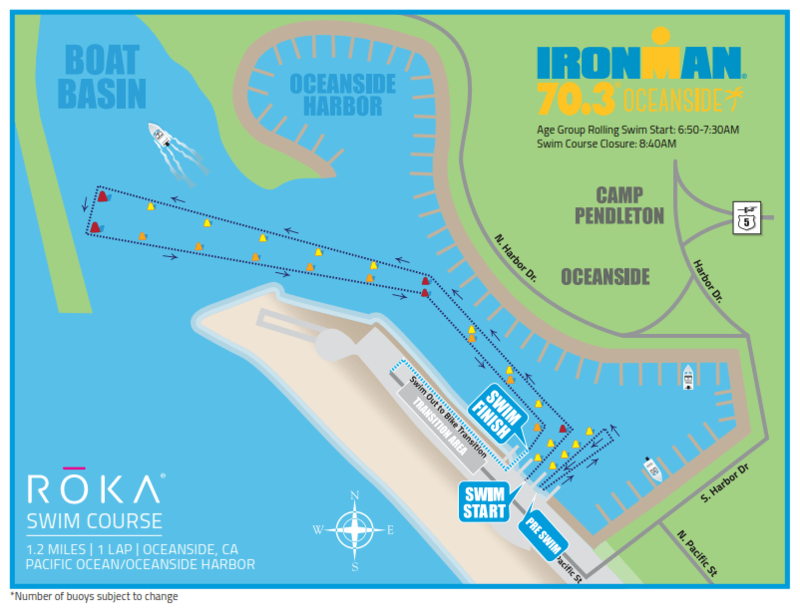 Oceanside, California offers triathletes a chance to race in the region that birthed the sport in the early 1970s in Mission Bay. Oceanside is located at the northern end of San Diego's North County, which includes the beach communities of Del Mar, Cardiff, Encinitas, and Carlsbadhome to surf, triathlon, and beach culture. Just half an hour south lies San Diego, with its world-famous zoo, parks, and other attractions to fill a spring break vacation. Just two hours away from the local mountains, skiing and snowboarding are other options. We are putting the “ocean” back into Oceanside! You get to experience the ocean and the harbor as we will be having a beach start and finish at the boat ramp inside Oceanside Harbor. You’ll get a chance to have a practice swim and then your friends and family will be able to “Hang Ten” with you til your time corral starts. The flow of the swim starts with a beach start navigating oneself thru the surf, then heading north towards the mouth of the harbor. This is approximately 4/10ths of a mile. Once thru the entrance, you’ll head along the north jetty towards the fishing dock enjoying the swells that will lift you in a forward motion. As you round the north jetty’s corner, you’ll be heading due east so keep in mind that the sun is coming up and it will be bright. The boat ramp will be coming up on your right as you past the last red buoy.. 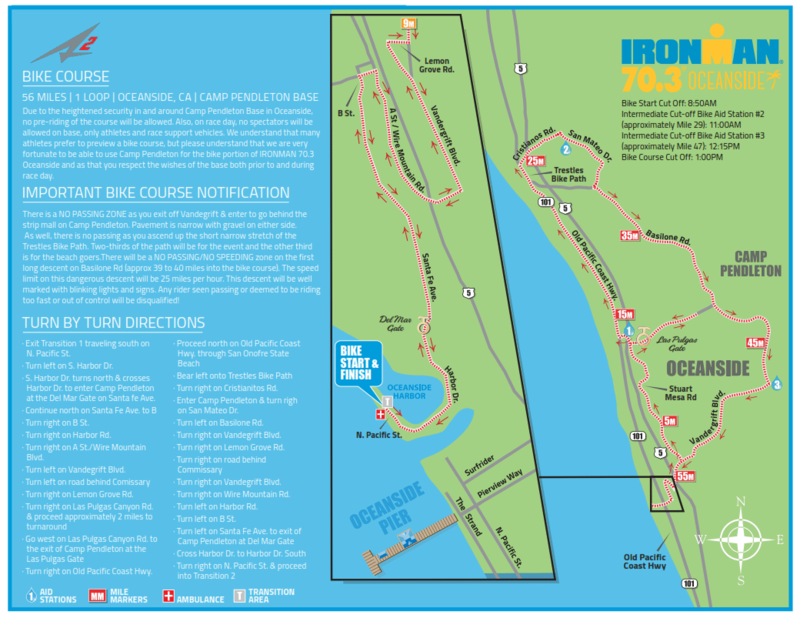 The course is one loop and transition is located in the parking lot that starts at the boat ramp and goes north towards the Harbor Pelican where your family and friends can get a coffee/coffee drinks and breakfast. The swim starts in the water in age-group waves. The protection of Oceanside Harbor with it's calm water gives way to rolling and choppy water just outside the harbor mouth. 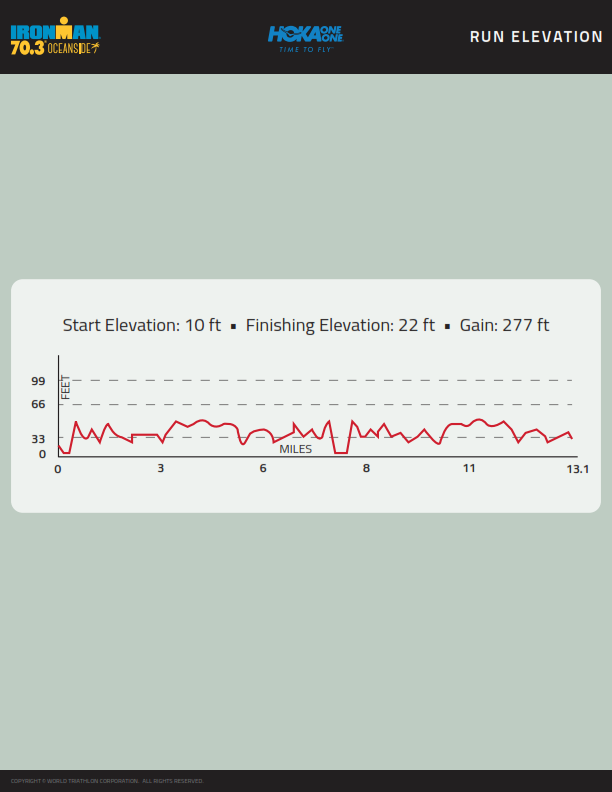 The sun's position makes navigating the buoys difficult at times but overall a great swim 1-loop course.The hills of Camp Pendleton are not normally accessible to cyclists but during this Ironman 70.3 they are. A green, lush landscape hides three incredibly challenging assents. It's one large loop so the scenery never repeats.The run course is dotted with spectators and enthusiastic volunteers. 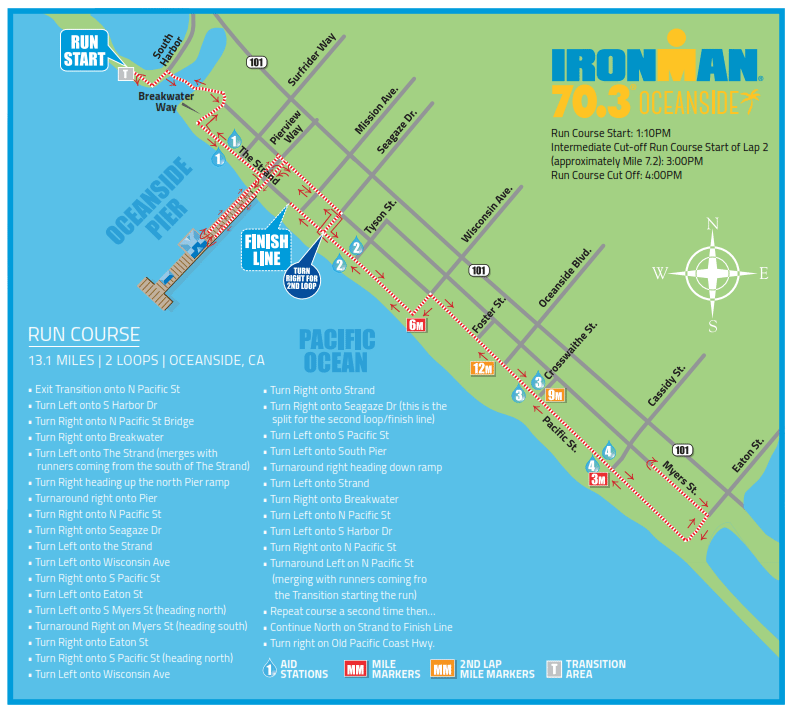 You get the ocean breeze the entire time during both out-and-back loops The whole event in extremely organized and very popular with the local triathletes as well as destination-minded traveling athletes. This is a must-do race and sells out in just a few hours. 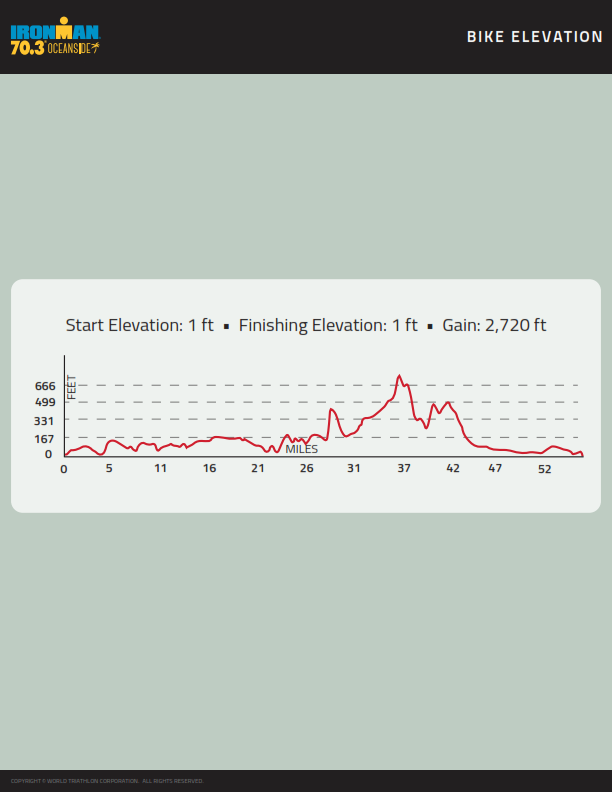 This is the only opportunity for most civilians to get to ride on the beautiful hills of Camp Pendleton, which hosts the second half of the bike course. Hilly, but incredibly beautiful.